There are bands you like to hear on the radio, bands whose latest album you want to buy immediately, and bands you would give your left arm to see live. Today’s band certainly has their share of followers—likely who fall into all three categories—but it’s their live performances that have truly put them on the map. Known for the summer-long tours of the U.S. and Europe, they’ve become an annual institution for folks all over the world. Songwriter David Matthews was working in Virginia as a bartender in 1990. A friend convinced the mild-mannered Matthews to record a demo for a few songs he’d written to see if he had a future in the music industry. Enlisting the help of a drummer and a saxophone player, both of whom Matthews had heard and loved, the band was on its way. The initial practices did not go well, being referred to as “heinously bad.” After a couple more tries, they determined they needed a sound with more range so they brought in a bassist and a keyboardist. Finally having a sound deemed fit for a demo, they began recording. They added a violinist to the session and a four track demo was cut. Gaining some traction locally, they began playing clubs and festivals. An independent record was released in November of 1993 to modest success. 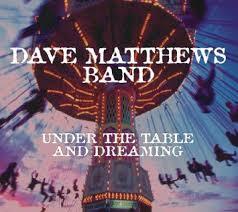 Today we focus on Dave Matthews Band’s (or DMB for short) first studio work Under The Table And Dreaming which was released in September of 1994. Dedicated to Matthews’ older sister Anne, who was killed by her husband in 1994 in a murder-suicide, the inner case packet is a photo of one of her children. Seeing immediate success due to the popular single ‘What Would You Say?’, DMB started to make some noise. The initial reaction was to throw this in the pop music genre and put it on the Billboard Top 40…but critics commented the album was so much more than the single, noting the diversity of the contributing musicians. People speculated that album came about when band was looking to have a jam session and it happened to get recorded. That’s sort of close to the truth, as much of the recording was experimenting and having fun, but with meticulous production quality. As of today, the album has sold nearly 10 million copies worldwide and is the band’s second best-selling album to date. I’m not sure this is DMB’s best album in the catalog, but it’s got a special place in the heart of many because it’s the one that got it started. Many of the tracks are still popular and are played live today, showing the staying power of their early work. While their music became more refined, and maybe a step up lyrically over the years, this album is nothing to shake a stick at. You could really hear the uniqueness even back then, when alt rock and angst was all the rage. While everyone else was yelling about injustices and going against the grain, Dave Matthews was tooting his horns, strumming his violin, and dancing to the beat of his own drummer. Adding up studio releases and commercially released live shows, they’ve sold nearly 50 million albums in 20 years, not too shabby. This is just the type of album to put on during a long Tuesday and plow through the work day. It’ll get your toes tapping and head bobbing. Give early DMB a shot today for $5 bucks, but don’t blame me if you end up dropping $150 on their Alpine show in June when you get hooked.